This post will introduce Christmas singles by three bands/artists who officially belong to the heavy weights of this earth, although you wouldn't guess so for two of the three, listening to their Christmas singles. We are talking here about the third Christmas single of Tarja and Christmas singles by Italian gothic metal band Lacuna Coil and the British hardrock veterans of Thunder. In my post of November 24 I wrote about the first two singles Tarja released, 'O Come O Come Emmanuel' and 'O Tannenbaum', both taken from her album 'From Spirits And Ghosts – Score For A Dark Christmas', and I also mentioned a third single be expected somewhere in December. Well, this third single has now been released, on December 8, and it turned out a very special one. Instead of just taking a song from the album and put two different versions on the single, as Tarja did with her first two Christmas singles, she something special, with the help of many prominent artists from the scene that made Tarja big, the gothic/symphonic metal scene. Together they recorded the 'Barbuda relief and recovery charity version' of 'Feliz Navidad', one of the (many) high lights of Tarja's album. Barbuda is a small Carribean island with 1500 residents, and is part of the state of Antigua and Barbuda. Tarja recorded her album in Antigua, where she also has a home. She writes on her website that she had just finished recording the album when the hurricane Irma hit Barbuda, which completely ravaged the island. To help the inhabitants rebuilt the island, Tarja decided to call some of her friends and ask them to help her out with recording a benefit version of 'Feliz Navidad'. This version is now released on a 7" (and digitally), with all proceeds going to rebuilding the island. Tarja's label Ear Music promised to double the amount of money raised. A very worthwhile effort by a great singer, so I can not recommended enough to get this single – on vinyl or digital. On the B-side of the vinyl version is the album version of 'Feliz Navidad'. Tarja's version is very different from the original version José Feliciano recorded in 1970, a version that, when it came out, was not really a hit, but now is one of the 25 most played Christmas songs over the world. Just as the original version, Tarja's version has lyrics in Spanish and in English. Feliciano included some English lines, as he was afraid that when the lyrics would be all-Spanish, radio station in the US would not play the record. That turned out a smart move, and has certainly helped to make this song the Christmas classic that it now is. Because, let's face it, how many Christmas classics do you know that are completely sung in Spanish? I'm thinking hard, but I can't come up with any. Tarja's version is moody, much slower than the original, and instead of inviting you to sing-a-long and party, Tarja's version invites you to sit down, relax and listen to the music. The charity version is even longer than the five minutes the album version lasts, and features, in order of appearance Michael Monroe (former vocalist of Finnish glamrock band Hanoi Rocks), Doro Pesch (former vocalist of German 80s metal band Warlock, and the-grand-old lady of German metal), Tony Kakko (vocalist of Finnish power metal band Sonata Arctica), Elize Ryd (vocalist of Swedish metal band Amaranthe), Marko Saaresto (vocalist of Finnish alt.rock band Poets Of The Fall), Timo Kotipelto (singer of Finnish power metal band Stratovarius), Simone Simons (singer of Dutch symphonic metal band Epica), Cristina Scabbia (singer of Italian gothic metal band Lacuna Coil), Joe Lynn Turner (former vocalist of Rainbow), Floor Jansen (another compatriot of me, formerly singer of Dutch gothic metal band After Forever, now singer of Nightwish, the band that started the career of Tarja), Hansi Kürsch (singer of German power metal band Blind Guardian) and last, but definitely not least, Sharon Den Adel (the third Dutch singer involved in this project, singer of Within Temptation). All these vocalist sing a line (well, in fact, they all sing the same line , 'We Want to wish you merry Christmas'), in good old 'Band Aid'-fashion. Tarja handles the vocals in the first part of the song, and all join together in grand finale. Tarja filmed a video for the album version of 'Feliz Navidad'. In most of her videos Tarja is always looking quite serious and sometimes even a bit scary, but not in this one: she gives us her most beautiful smile! The charity version does not come with a video, but you can listen to the song on Spotify and with an eye on the list of participants, check which of the vocalist is your favorite. Or just enjoy the music. Not a guitar to be heard on Tarja's 'Feliz Navidad', but Lacuna Coil's single 'Naughty Christmas' makes up for that. 'Naughty Christmas' is a genuine metal song, and every metalhead's favorite Christmas figure, Krampus, is the star of this song. There is a connection with Tarja's third Christmas single, as Lacuna Coil's Cristina Scabbia was one of the singers featured on 'Feliz Navidad'. Lacuno Coil formed in 1994, in Milan, Italy, as Sleep Of Right, by vocalist Andrea Ferro and bassist/composer Marco Coti Zelati. Around 1995 Cristina Scabbia joined the band, first as background vocalist, but later she became one of the lead vocalists. In 1997 the band changed its name to Ethereal and signed to Centuria Media, one of the biggest metal labels in the world. When it turned out there was already a Greek band by the name of Ethereal, the band settled for Lacuna Coil. After initial success in Europe, around 2004-2005, the band also made a major breakthrough in the USA, and their 2002 album 'Comalies' became the best-selling album in the history of their label. Over the next few years, Lacuna Coil would have several albums in the upper ranks of the Billboard 200 album chart - quite an accomplishment for a metal band from Italy. In the last few years, the sound of the band became less melodic and heavier. 'Naughty Christmas' was already recorded last year, and was also released digitally as a stand-alone single in December 2016. The song features three different vocal styles: a brutal male one, the personification of Krampus ('(I'm on my way / Naughty children be afraid / One at a time / I'll take you all away'), an annoying kid's voice, ('But I have been so bad / Santa will not bring me gifts and... / Krampus might come / What is this noise on the backyard? '), sometimes joined by more annoying kid's voices ('Na na na na na na-naughty Christmas') and the melodic female vocals of Cristina Scabbia in the role of the storyteller ('Watch out / The animal / Coming to get all the children / Faster / You've got to hide'). The music is both melodic and heavy and there are enough sleigh bells to give the song, despite all the heavy guitars and vocal brutality, a genuine Christmas feel. 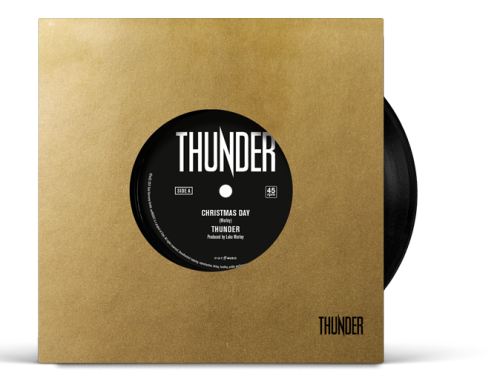 The third single in this overview of the heavier side of Christmas does have guitars, but Thunder's song 'Christmas Day' is the opposite of a heavy song. It's a heartfelt ballad, and the only guitars used are acoustic, and that is almost all that is heard, apart from some subtile drums and keys, and the voice of singer Danny Bowes. Thunder was formed in 1989 by three members of Terraplane, Danny Bowes, Luke Morley (guitar) and Gary 'Harry' James. All three founding members are still members of Thunder, 28 years later. The band was very successful in the early 1990s, with several UK top 10 albums and more than 10 hits in the UK singles charts. In 2015, they made a return to the UK album top 10 with their tenth studio album, released on earMusic (the same label that puts out Tarja's records). Thunder played several Christmas shows since 2011, so the fact that the band decided to record a Christmas single was maybe to expected. 'Christmas Day' is a lament of a man waiting for his loved one to call him, but at the same time knowing he will be alone at Christmas this year. Bowes sings it with a very emotional voice, that, to be honest, I had to get used to – putting emotions in vocals is of course great, but one should not over do it. 'Christmas Day' is released on many different formats, including a 10” and a 7”. The 7” doesn't come with a picture sleeve, as the 10” comes, but the vinyl is housed in a golden sleeve. The 7” (and also the other formats) can be ordered through earMusic. The band also made a video, that shows Bowes singing the song amids a crowd of (mostly young, hip and handsome) party heads, of whom many to try to comfort him, althought without really paying attention to his grief it seems, as they are too busy partying. The wild party going on in the video totally desonates with the mindset of Bowes, and with the music the band is playing. But it works to get the general mood of the song through.